One of the best things about polymer clay is its versatility. In the right colors, blends, and textures, clay can “become” gemstones, pebbles, glass, leather, wood, various fabrics, paper, and more. It can mimic jewelry-making and other creative supplies that are sometimes difficult to source, like wings, flowers, creatures, and leaves. 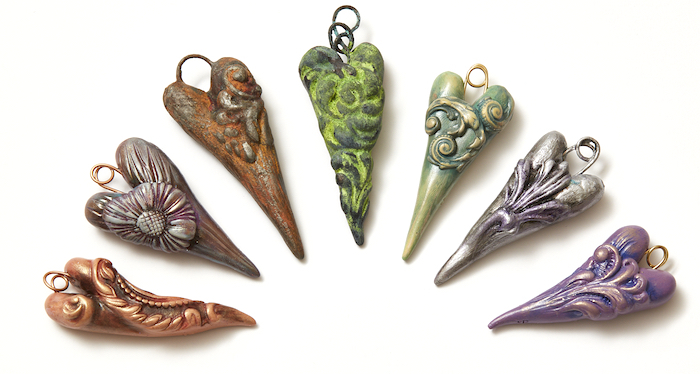 Polymer clay can look like metal or wood, but it’s lightweight, so you can use it in more ways. Polymer clay is also more affordable than almost everything it can be made to look like! Clay artists like Christi Friesen have spent years finding ways to make this versatile material look great as well as look like something it’s not. With blends, canes, surface treatments like textures as well as shimmery powders and inks, embeddables and more, the polymer clay becomes a base onto which your art grows. 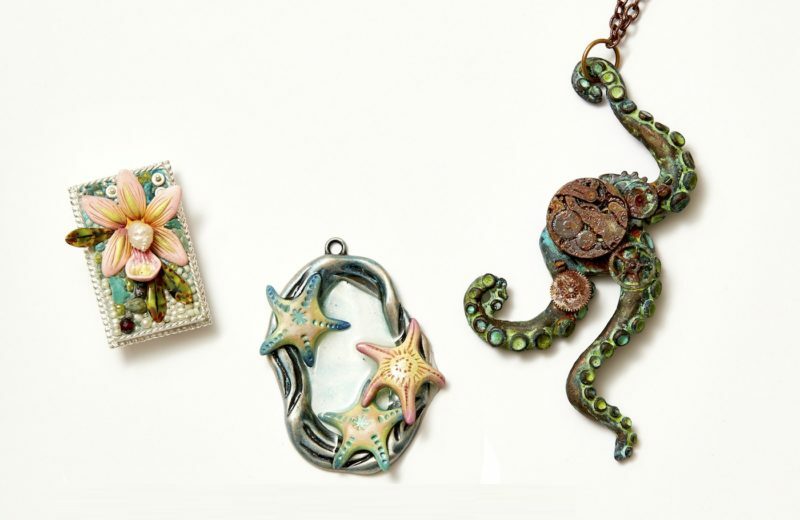 Once you’ve learned to create “charming charms or beautiful beads,” as Christi calls the projects in her online workshop, Polymer Clay Jewelry: Learn 10 Beads and Charms, there’s no end to the ways you can use what you make. Your clay components can be used as charms or pendants in jewelry, or you can make hole-less components to set in beaded or metal bezels. Here’s more about the versatility: If jewelry making isn’t your thing, those same shapes and components that you learn to make with Christi can be used to embellish handmade journals and books, as ornaments, key chains, bookmarks, hair accessories, accents on purses and other wearables, and . . . I could go on and on! As is the case with many creative materials and techniques, once you’ve got the basic techniques down, the artist in you will take over and you’ll have no shortage of ways to use what you’ve learned. Christi has a basic polymer clay workshop, Polymer Clay Jewelry: Design Basics, designed to make you familiar and comfortable with polymer clay techniques, tools, and supplies. It’s specially created for absolute clay beginners and clay enthusiasts who want to start out with the best foundation. Christi reviews tools and supplies used with clay. Another reason clay seems so versatile to me is that you can “shop” in your house to find other “tools” to use with clay. Pasta machines are a perfect example of how everyday items can be adapted to use with clay. You can roll out perfect clay sheets with a pasta machine, from which you can cut shapes (using cookie cutters, perhaps? ), strips, and more. There are all kinds of things in typical kitchen drawers that would be fun to use with clay. 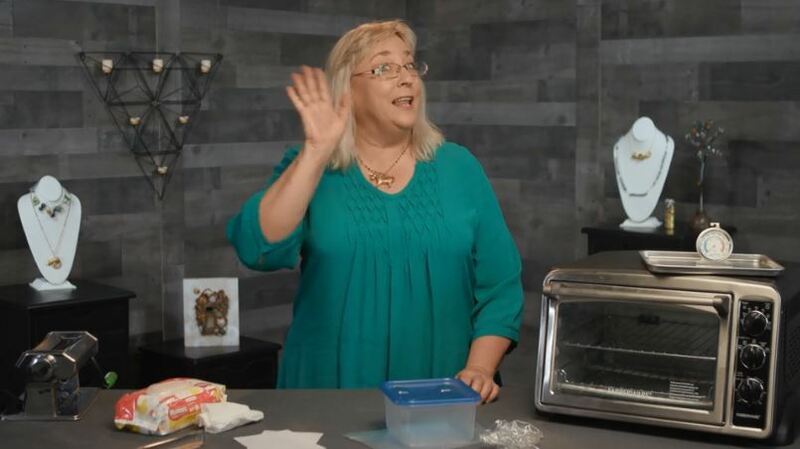 Once you’ve learned all about tools and materials with Christi, she’ll ease you into working with polymer clay with basic techniques. Learning how to condition it, blend it, bake it, and store it are essential for mastering polymer clay. These clay building blocks apply to all types of polymer clay work, so you’re off to a great start! 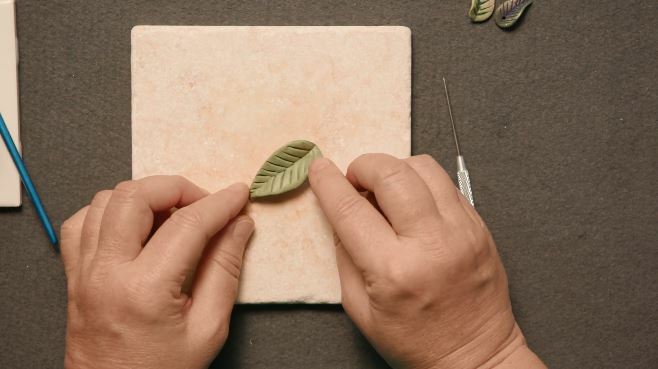 The clay introduction continues when you put all you’ve learned together in a simple beginner project: clay leaves. 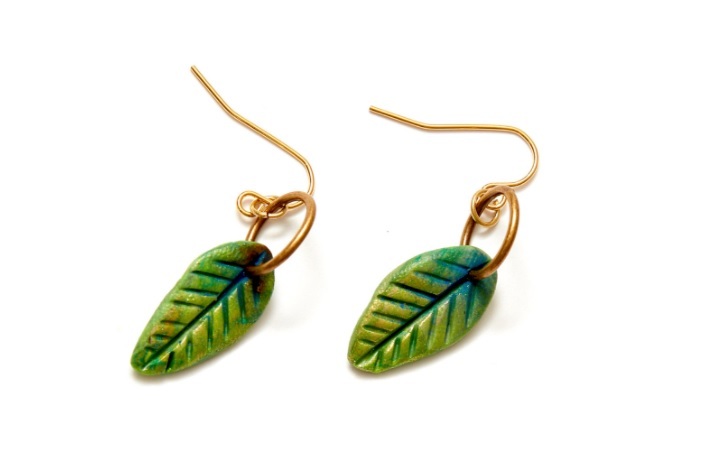 Through an eight-part, 22-minute video in Christi’s course, you’ll learn how to make polymer clay leaves and turn them into earrings. 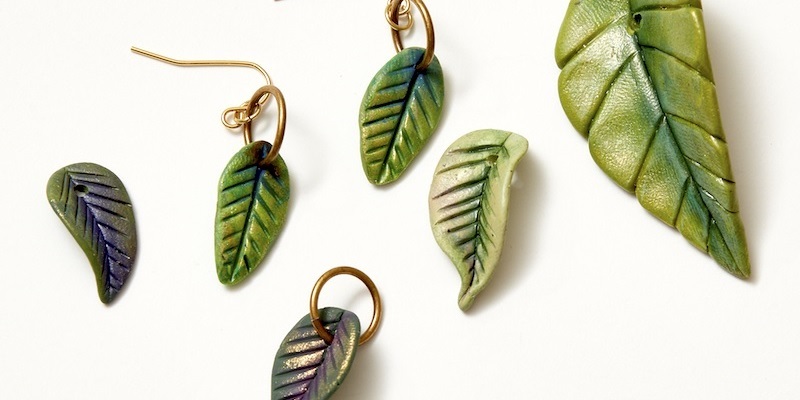 Don’t want leaf earrings? Don’t worry! You can use your leaves in other jewelry, on a handmade book or bookmark, to build a tree sculpture, in a collage… and dozens of other ways, I’m sure! Once you’ve learned the basics with Christi (or perhaps you already have some clayworking knowledge? 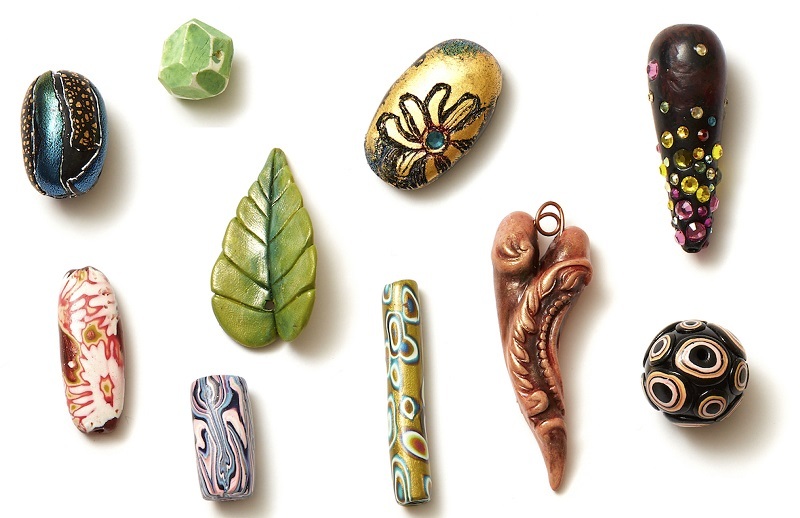 ), you can move on to create “charming charms or beautiful beads” in her next online workshop, Polymer Clay Jewelry: Learn 10 Beads and Charms. But again–don’t let the idea of beads and charms limit your imagination. You’ll think of all kinds of ways to use the skills from this workshop to make components for all kinds of art. I particularly love the charm bracelet a few photos up, which features the leaves and some of the other types of beads you’ll learn to make in this workshop. Once you’ve done a few of the lessons, your creativity will branch out. 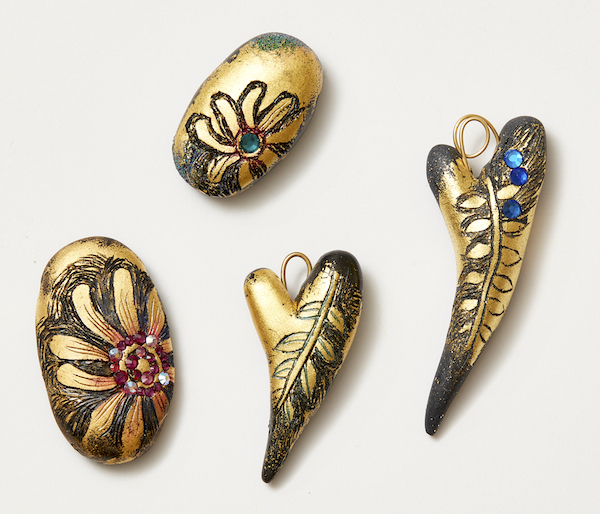 Beads can be modified into the tops of tassels, hearts can become pendants, ornaments, or bookmark embellishments. 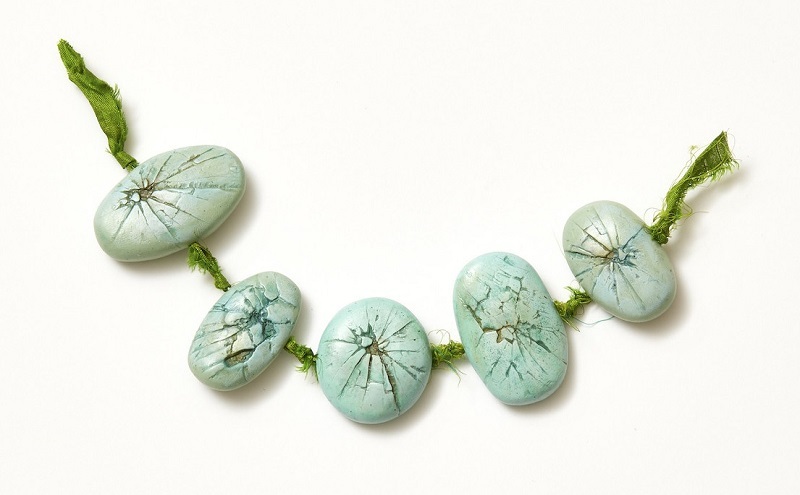 There’s a long list of ways to use these creations in jewelry and mixed-media projects. String large clay beads into purse handles. Use clay hearts on Valentine cards. See where I’m going here? Way beyond beads and charms! In addition to all the fun you’ll have learning, Christi’s workshops have discussion boards so you can talk with fellow students. You’ll be inspired by her gallery of clay designs, and just-for-fun quizzes help ensure you get the most out of each lesson. Each tutorial shown in video has a companion project sheet with images and written steps. There’s also a materials list, tip sheet, and findings fact sheet to help you turn clay creations into jewelry. These workshops are packed with information to help you succeed and have fun! Christi is such a pro! To me, that means she not only knows her stuff, she knows how to share and teach it in a way that everyone can learn. She makes all of her polymer clay techniques look effortless while also making it very clear to the student. It’s no wonder she has a fanbase and classes all over the world! If you can’t travel to one of Christi’s exotic class locations, we’re bringing her expertise to you. 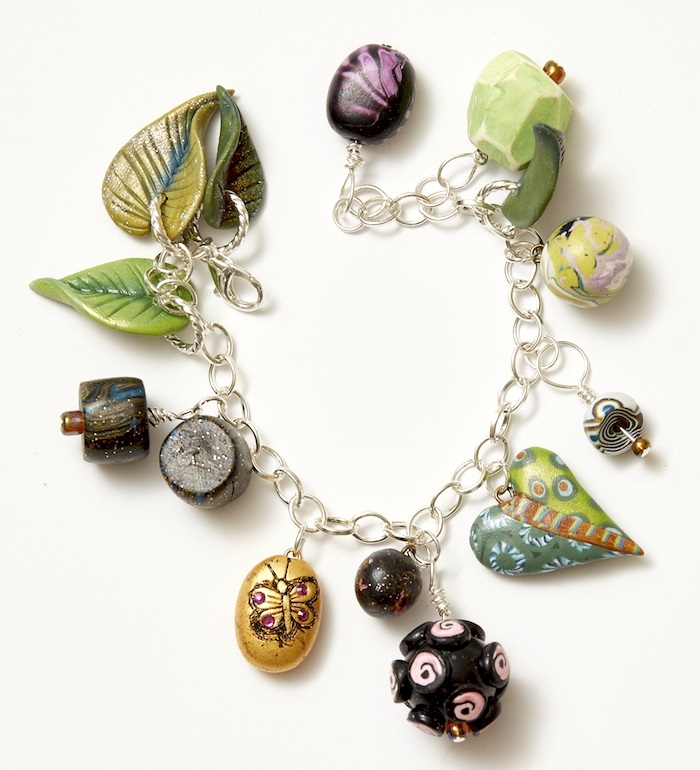 Join Christi in her polymer clay online workshops, Polymer Clay Jewelry: Design Basics and Polymer Clay Jewelry: Learn 10 Beads and Charms. You’ll learn polymer clay techniques for jewelry making that can also apply to other creative pursuits. Make bookmarks, ornaments, home accessories, hair barrettes, collage embellishments, toys, and more when you start with the basics with Christi! Play with polymer clay! Don’t miss these books, videos, and workshops!